Music has been coursing through smoldering jazz vocalist Andy James’ being since she was a little girl. Twice blessed as a gifted singer and dancer, Andy decided her showbiz act one would be a career as a world-class Flamenco dancer, collaborating with the milieu’s most exceptional. Now, she announces, act two, a career as a stunning jazz singer with an irresistible 40s swing-style debut album, Caravan. With the release of her first CD, Caravan, Andy emerged a fully formed artist and, on the strength of her talents, has been able to work with a diverse list of industry heavyweights, including mix and mastering engineer Josh Connolly (Justin Bieber, Santana, Pharell Williams); platinum mastering engineer Bernie Grundman (Carol King, Steely Dan, Michael Jackson, Prince); in-demand producer Piero Pata; noted vocal producer Zeffin Quinn Hollis ( Les Misérables, The Fantasticks, and Company); and big band jazz icon, Grammy Award-winner and Emmy-nominee Bill Cunliffe. Jazz pianist, composer and Grammy Award-winning arranger Bill Cunliffe is known for his innovative and swinging recordings and compositions. Bill began his career as pianist and arranger with the Buddy Rich Big Band and worked with Frank Sinatra, Joe Henderson, Freddie Hubbard, Benny Golson and James Moody. He has since established himself as a solo artist and bandleader, with more than a dozen albums under his name. Bill currently plays with his trio; his big band; his Latin band, Imaginación; and his classical-jazz ensemble, Trimotif. He performs in the U.S. and around the world as a leader and sideman as well as a soloist with symphony orchestras. 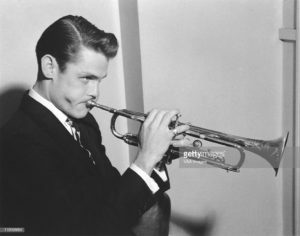 Bill was awarded a Grammy for Best Instrumental Arrangement for “West Side Story Medley,” on the album “Resonance Big Band Plays Tribute to Oscar Peterson” (Resonance Records, 2009). In addition to receiving five Grammy nominations, he is a two-time Emmy nominee. 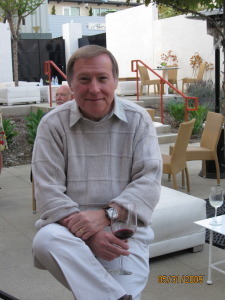 The Los Angeles Jazz Society honored Bill in 2010 with its Composer/Arranger Award. That year he was also named a Distinguished Faculty Member of the College of the Arts at Cal State Fullerton, where he is a jazz studies professor. 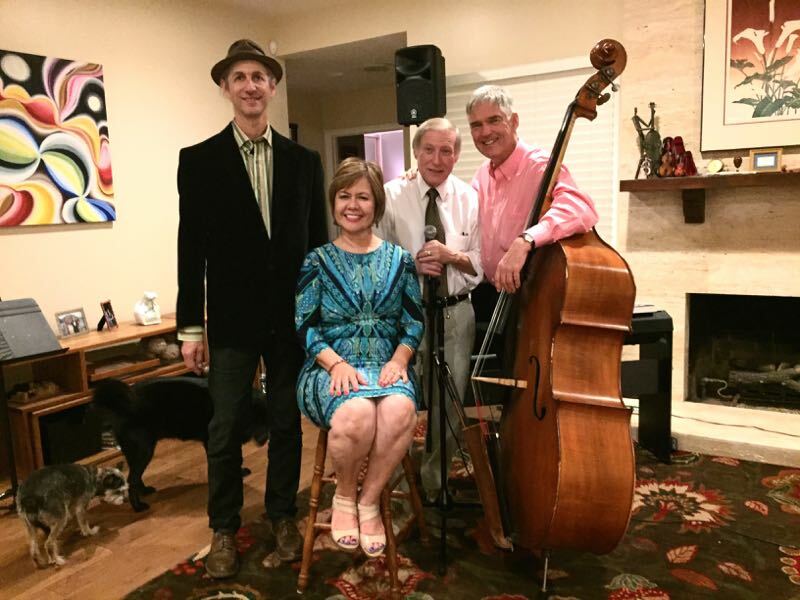 He also teaches at the Skidmore Jazz Institute and the Vail Jazz Workshop. BECOME A CalJAS MEMBER TODAY! Becky Hughes & Dale Boatman. Incorporated as The California Jazz Arts Society (CalJAS) in January 2005, we now begin our 15th season as a nonprofit presenting and promoting jazz in intimate settings. 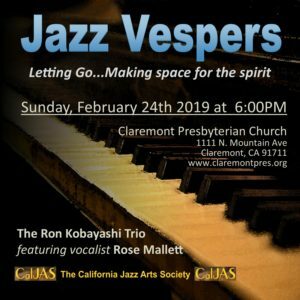 well received Jazz Vespers series featuring Debbi Ebert and the Ron Kobayashi Trio. Additionally, we are working out details to add a limited CalJAS PRESENTS series at this venue. CalJAS and CPC are also making plans to schedule jazz clinics for high schoolers, as well as adults. We are excited to announce that CalJAS at The Magic Castle will continue during the summer of 2019 but will move to Tuesdays. Those of you who have attended any of the past 25 concerts know how special these events are. Once again, we will be encouraging you to renew your membership for 2019, and to help spread the word in order to recruit new members and contributors. One of our continuing goals is to identify and welcome the business community to our CalJAS family as Platinum Sponsors, Benefactors, or underwriters for our programs and scholarships, and to stay ahead of increased expenditures. SINCE MOST PROGRAMS ARE FREE OR HEAVILY DISCOUNTED TO OUR MEMBERS, PROCEEDS FROM THE EVENTS CANNOT ENTIRELY FUND OUR EFFORTS. IT IS OUR MEMBER DONATIONS THAT DETERMINE THE TYPE AND FREQUENCY OF OUR CONCERTS AND MUSIC EDUCATION PROGRAMS. *Harry Warren (born Salvatore Antonio Guaragna, December 24, 1893 – September 22, 1981) was an American composer and lyricist. Warren was the first major American songwriter to write primarily for film. He was nominated for the Academy Award for BestSong eleven times and won three Oscars for composing “Lullaby of Broadway“, “You’ll Never Know” and “On the Atchison, Topeka and the Santa Fe“. He wrote the music for the first blockbuster film musical, 42nd Street, choreographed by Busby Berkeley, with whom he would collaborate on many musical films. Over a career spanning four decades, Warren wrote more than 800 songs. Other well known Warren hits included “I Only Have Eyes for You“, “You Must Have Been a Beautiful Baby“, “Jeepers Creepers“, “The Gold Diggers’ Song (We’re in the Money)“, “That’s Amore“, “The More I See You“, “At Last“ and “Chattanooga Choo Choo“. This will sell out quickly.